I saw some vids of it on youtube and I really like it. It is still available to buy anywhere? If so how much does it cost and where can I get it? I am VERY VERY new to the synth world. What does a rack do again? Does it just plug into another keyboard or somting? Yep. It's a module without a keyboard, so you need a midi source to trigger it - keys, sequencer, etc etc. 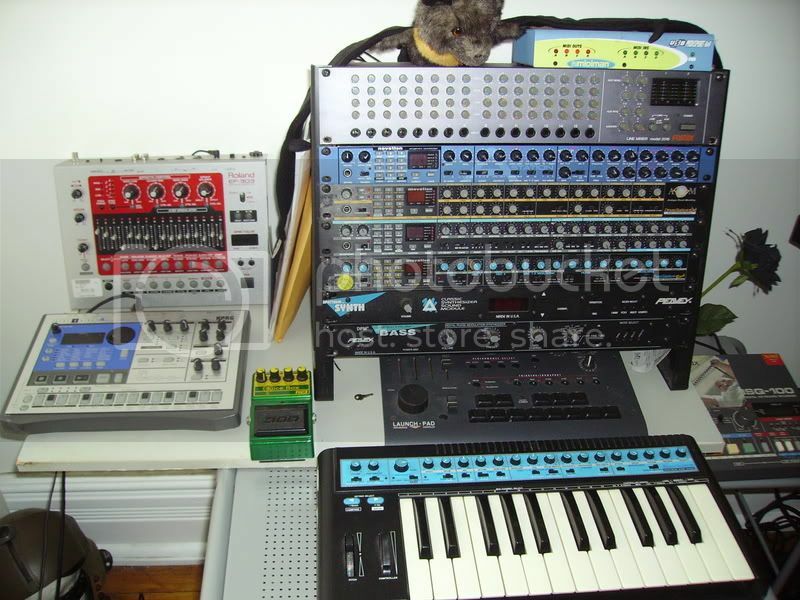 The module fits into an equipment rack with other stuff - more synths, effects, and so on. Does it need a rack to work. If not I will save up my money to buy the bass station rack. No, the rack is just a case. There's actually a guy selling a Bassstation rack over at Harmony Central KSS right now for $185 which is a pretty good price. As stephen said, you need a Midi controller keyboard to use it, and although it helps to have a 19 inch rack to mount it in, it could lay flat somewhere and work fine, albeit easier to jostle around when you tweak the knobs. The rack is actually a better product than the keyboard version because it has patch memory and CV/Gate to control another analog synth with. I've used the latter to control my SCI Pro~One, sending the Pro~One audio output to the BassStation audio input to get a much bigger sound. I would recommend the Bass Station keyboard. With the rack, you'll need a controller keyboard, then you'll need a big nasty rat-fur covered rack to house the device, then a place to put the rack...next step is to lose interest because it's a pain in the a*s.
The Bass Station Keyboard is MIDI - so if you do decide to get into synths, you could use it to control the legions of cool rack modules available. Just throwing out that tidbit; I had no f**k idea what MIDI was or what it did and learned it was no big mystery AT ALL. Solderman wrote: The rack is actually a better product than the keyboard version because it has patch memory and CV/Gate to control another analog synth with. +1, I'd opt for the rack for it's additional features. very nice demo of the synth. The keyboard model has patch memory as well. JSRockit wrote: The keyboard model has patch memory as well. My apologies, the keyboard version has 7 user patches, and the rack has 60.
crystalmsc wrote: very nice demo of the synth. I would get the keyboard version but you really cant buy it anywhere. I realy like the rack version also. I can't vouch for the rack version, but the keyboard version has rather cheap build quality. It doesn't feel like very sturdy, it's all plastic. It has the mountings to strap it on ala a keytar but if you did that I doubt the synth would last very long at all. If you're planning on placing it on your desk and keeping it there then you'd be safe. Bend it to fit, Paint it to match. Is anyone selling the keyboard version?